Bio: Frank Wise is a Member of the: Cheynne River Sioux Tribe. His Spirit name is: Buffalo Horn Cloud. Frank Lives in: Casper Wy. He has a BSW degree from the University of Wyoming minored in Addiction Counseling. 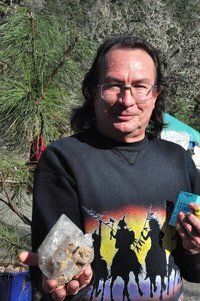 Frank mostly attends and supports Lakota Spirtual Practices but he has worked with spitual leaders of most faiths and religions. He speaks with Rave about his message: Time to come together and put aside our differance for the fhuter of our childen and our mother the Earth. This entry was posted in Make No Bones Shows and tagged Cheynne River Sioux Tribe, Chief Arvol Looking Horse, Connecting with Spirit, Frank Wise, Honoring, Indigenous, KAOS 89.3 FM, Make No Bones About It, Time to come together and put aside our differance for the fhuter of our childen and our mother the Earth.. Bookmark the permalink. How does one get in contact with Frank Wise?